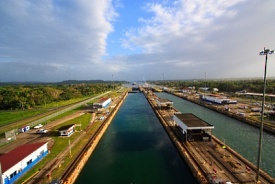 The Panama Canal is both an engineering masterpiece and a natural wonder. Connecting the Atlantic and Pacific oceans, the passageway crosses the huge, man-made Gatun Lake and the amazing Gaillard Cut, blasted out of solid mountainside. The great locks raise and lower your ship along a 50-mile waterway -- sometimes with just inches to spare on either side.